Sometimes, all you need to know is the title: Battlepug. Want more? Okay. 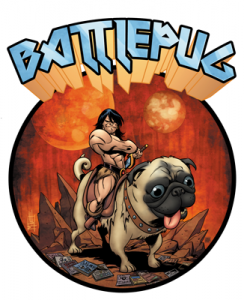 Some time ago comic book artist Mike Norton created a t-shirt design of a Conan-type barbarian riding the back of a giant-but-cute doggie, which he titled “Battlepug”. The t-shirt design was such a hit that about one year ago Mr. Norton decided to create a Battlepug web comic, which follows the adventures of a muscular warrior, his battle-pug mount, and an old lunatic as they travel the land, yes, battling with the likes of a giant evil baby seal and a colony of gophers who team up to form a giant mega-gopher. You see it’s all a story a naked lady is telling to her two pet dogs… Well, maybe it’ll make more sense if you read it. Or maybe not. Now word is out that the web comic has done so well that Dark Horse Press will be releasing a collected print version of the first year of Battlepug this coming July.